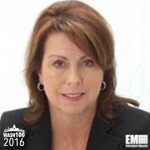 Executive Mosaic is honored to introduce Jill Singer, vice president of national security at AT&T‘s government solutions unit, as an inductee into the 2016 edition of the Wash100 — Executive Mosaic’s annual selection of influential leaders in the government contracting arena. This is Singer’s second year for receiving the Wash100 award. Singer took on her current role in January 2015 27 years of public and private sector experience and oversees the telecommunications company’s technology products and service offerings in the U.S. national security market. Prior to AT&T, she was a partner at Deep Water Point where she worked with federal customers to help them implement transformation, leadership, technology and strategic programs. Her federal career includes time as chief information officer at the National Reconnaissance Office and deputy CIO at the CIA as well as chief of systems engineering, architecture and planning for CIA’s global infrastructure organization. She had also directed the State Department‘s diplomatic telecommunications service. Singer currently provides guidance to the Intelligence and National Security Alliance as a member of the nonprofit’s board of advisers and works as an executive-on-ground at the University of Virginia’s McIntire School of Commerce and co-chair of the Armed Forces Communications and Electronics Association’s international cyber committee. During her time with industry, she also held positions at Science Applications International Corp., GE Aerospace and IBM. Executive Mosaic congratulates Jill Singer and the AT&T’s government solutions team for their selection to receive this award.